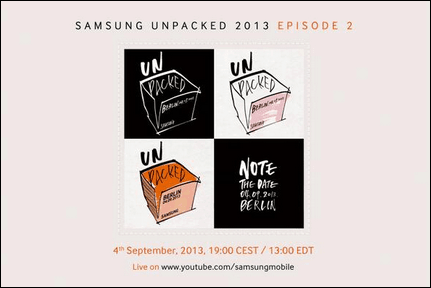 A Samsung Unpacked event has been announced by the company on its Twitter account for September 4, and speculation is rising that the company could unveil the Samsung Galaxy Note III in the German capital. 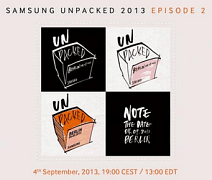 As usual, Samsung has decided to keep quiet on what exactly what will be launched in Berlin, and has only published the invitation which it published on its Samsung Mobile Twitter account. Still, it’s pretty safe to assume that, just like in the case of the company’s last big launch event, we’ll find out what it’s all about a few days earlier. And you can probably say, without much of a fear of being wrong, that the Samsung Galaxy Note III will play a big part in the event. The smartphone has been rumored for a while now, with purported specs including Samsung’s new octa-core CPU, the Exynos 5 Octa 5420 — at least for some of the versions — coupled with 3 GB of RAM memory, a screen with a size between 5.5 and 6-inches with a Full HD resolution and a 13 megapixel camera. Also rumored are LTE connectivity, with the smartphone definitely sporting the S-Pen. Perhaps with some interesting new features that Samsung will add, as it did for the first two smartphones. It will be interesting to see whether Samsung also plans to introduce a smart watch at the event, since the fact that it has been developing one has been known for a while now and a patent filing by the company for such a device has been recently unearthed. With the September event just a month away, I expect the speculation will increase over the next few weeks, as it always does before an important product launch, and there will certainly be more leaks coming.